A Classic model in every sense, being pratical, robust and a superb performer whether flown as a slope soarer or as a powered glider. The kit can be built as a glider or as a powered glider using the pod supplied. Additional wing plates can be purchased so that the glider can be interchangeable in moments from glider to power. Moulded canopy, Power pod, and tail fairing. Full size plan and instruction booklet. Av. 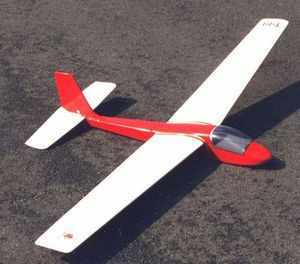 Weight : 1.1kg (2lb 8oz ) Glider. Av. Weight : 1.47kg (3lb 4oz ) Power. Wing Loading : 10.9 and 14.2 ozs/sq.ft. Power : .15 IC or brushless motor.